You’re never going to believe what’s on the horizon from Fuji. It’s the launch of an all-new film camera. Not just film, but medium format no less. Foldable and compact, the new GF670 Professional is capable of shooting either 6×6 or 6×7 format and accommodates both 120 and 220 film. A coupled rangefinder, exposure compensation, manual exposure and aperture-priority automatic modes compliment the 80mm Fujinon EBC lens. If you need to light it up, the GF670 has flash sync speeds ranging from four seconds to 1/500 of a second via hot shoe mount or PC socket. 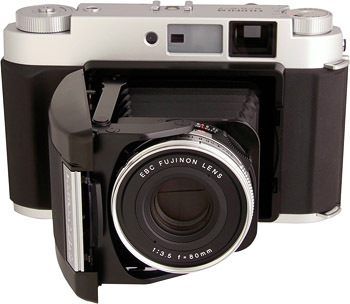 Some may question the relevance of Fuji’s new film camera, but many photographers do still crave the product and process of shooting film and the GF670 may be a modern-day tool to satisfy that hunger. I think back to the magic of creating some of my first photographs on film and get nostalgic thinking about this camera. It’s comforting to know that one of the companies that helped build modern photography isn’t ready to let the tradition of film die out just yet.